The geomorphic investigation of the Hughes Creek has been completed and the report is now available to download. 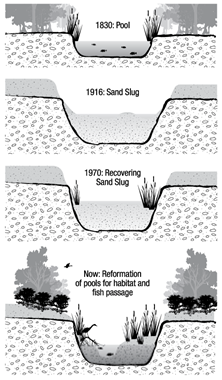 The report by Wayne Erskine titled River Reaches, Historical Channel Changes and Recommended Methods to Improve Macquarie Perch Habitat on Hughes Creek, Victoria evaluates the historic changes and current status of the stream with regards to sedimentation, confirming the stream is on a trajectory of recovering, as depicted here. The report confirms the catchment is no longer contributing significant volumes of sediment to the stream, but acknowledges that the sand within the channel continues to be reworked in high flows, posing a threat to endangered Macquarie perch habitat. The report highlights the importance of instream and bank vegetation to stabilise the sand and reduce the amount mobilised in high flow events, encouraging stock fencing to protect riparian vegetation and further revegetation works to accelerate river recovery. The other key recommended actions to strengthen the Macquarie perch population included enhancement and creation of refuge pools, improved aquatic habitat connectivity and management of introduced fish species.